The Vision recumbent ergometer R60 is a recument ergometer of gym quality. It offers long durability and is suitable for frequent, intensive use. The training position is joint-gentle and ergonomic. The training computer is clear and very easy to use. 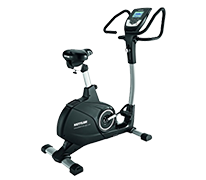 The Vision Fitness recumbent ergometer R40i Elegant has 13 programs and a resistance setting from 40 to 400 Watt - all conditions for an effective and varied stamina workout. The display of the recumbent bike can play Virtual Active videos - do real tours on the Vision Fitness recumbent ergometer R40i Elegant. The Vision Fitness R40i Touch is an excellent recumbent ergometer you can easily control via touchscreen. The stamina fitness equipment has a 10 inches LCD display where you can select 17 programs. The sturdy flywheel provides a constant pedal run, the resistance can be set in 40 to 400 watt in 1-increments. 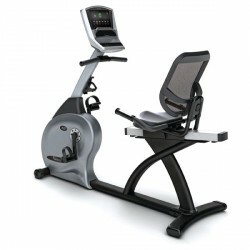 The Vision ergometer U60 is a top-quality fitness equipment of gym quality. The fitness ergometer of an extremely sturdy construction (190 kg maximum user weight) is also suitable for continuous operation at a gym. The training computer is easy-to-use; many programs provide a varied workout. The Vision Fitness ergometer U40i Touch is an extremely stable fitness equipment which is controlled by touchscreen display. 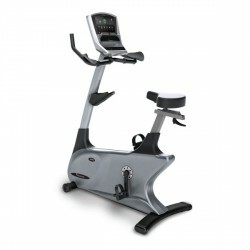 The bike ergometer with touchscreen offers 17 training programs and can produce a resistance output of up to 400 Watt. Training results are saved to watch progress. Tour videos can be played on the 10 inches display. 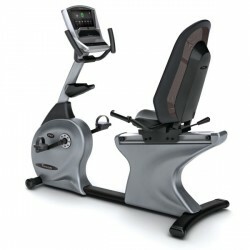 The Elegant console of the excellent Vision Fitness ergometer U40i offers even more functions. The stamina fitness equipment provides 13 training programs and a resistance output of up to 400 Watt. Do training tours in Swiss Alpes with the 7 inches LCD monitor. The Vision Recumbent Bike R20 Touch has a comfortable, back-gentle seat and a low entry. Do all settings with the touchscreen. 17 programs provide diversion; in addition, you can connect the Passport Media Player (available as accessory) and simulate tours on your tv. 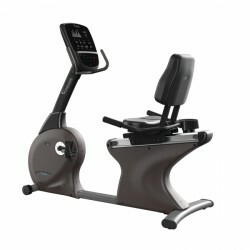 The Vision Recumbent Bike R20 Touch is equipped with an iPod connection and loudspeakers. The balance mass of 10.5 kg guarantees a comfortable concentric run. The Vision ergometer U20 Touch has a precisely adjustable magnetic brake system with a balance mass of 10.5 kg. Resistance can be adjusted in 20 levels or in the watt controlled mode in 1-watt-increments from 40 to 400 watt. Do all important training settings with the touch-sensitive screen. 17 programs provide diversion - in addition, you can connect the optionally available Passport Box and exercise with multi media programs. The Vision Recumbent Bike R20 Elegant has a coloured LCD display for optimal overview of the workout. Training comfort is ensured by back-gentle, ergonomic seat, and low entry. The Vision Recumbent Bike R20 Elegant has a flywheel of 10.5 kg for constant motions. 13 programs provide diversion. In addition, the optionally available Passport Media Player can be connected and multi media workout sessions are made possible. The Vision ergometer U20 Elegant is equipped with 13 programs, 2 of it with pulse control fo rmotivating workouts. The magnetic brake system has a balance mass of 10.5 kg, intensities from 40 to 400 watt are possible in watt controlled mode. Connect the Passport-box, available as accessory, and exercise in a multi-media way - for even more variation. Very comfortable seat on this! Adjustable, too, both in length from the pedals, and in the seat back angle. I was hoping for a high back and got it. This is the same as the other two, only the console is different. It's quite heavy, so best to have two people to assemble it, though once out of the box, it can be done by one person. Note: Customer Service is excellent! They sent the wrong mains plug for Switzerland and when I emailed them, not only did they respond right away, but also, the new mains plug arrived the very next day! Thank you! Vision Fitness ergometers and recumbent bikes allow an effective cardio training of commercial quality. Ergometers and recumbent bikes are suitable for home use as well as training at gyms thanks to their first-class quality. Vision Fitness is well-known as supplier of high-quality fitness units. Of course, these quality standards are also valid for ergometers and recumbent bikes of Vision Fitness. Thanks to an excellent workmanship of selected materials, Vision Fitness guarantees a first-class state of supplied ergometers and recumbent bikes and a very long durability. Vision Fitness ergometers / recumbent bikes can be used either at fitness gyms as well as for ambitious home training thanks to their stability. The top model is the Vision recumbent bike R40i Touch. 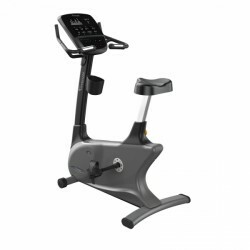 This excellent recumbent bike makes a professional cardio training of highest level possible. Several adjustment possibilities guarantee an optimal seat comfort. The modern, user-friendly training computer with touchscreen control offers a very varied training.